There are a number of significant weather events that residents of this great nation have to endure every year. Given three guesses as to which one produces the greatest number of fatalities, what would your answer be? Violent winds from a hurricane or tornado, lightning from thunderstorms, and rising floodwaters come to mind. But the weather event that actually produces the greatest number of fatalities is heat. 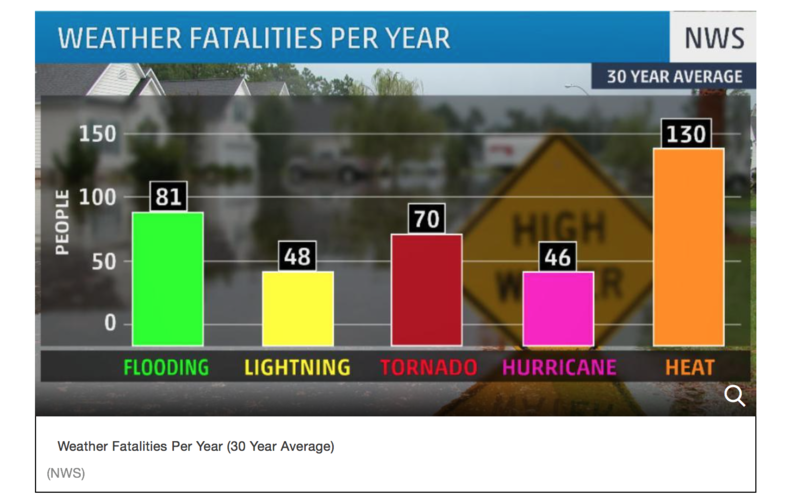 The U.S. Natural Hazard Statistics provide statistical information on fatalities caused by weather related hazards. These statistics are issued by the National Weather Service. According to a National Weather Service report, in a 30-year period from 1986-2015, an average of 130 people lost their lives each year as a result of heat; a greater number than all other weather events. With tornadoes, the warning system has become much improved over the years, especially since Doppler radars have been in use since the 1990's. Weather sirens and weather radios alert residents of an area when a tornado warning is issued and they can take cover. Hurricane watches and warnings are timelier, and the area under these advisories is more specific than in the past, so people have more time to prepare or evacuate. As a result, fatalities from these events have been greatly reduced over the years. Heat is a much different kind of weather event, however. Heat waves (a period of at least 3 days with temperatures of at least 90 degrees and accompanied by high humidity levels) often cover a large area. We are all sensitive to heat in one way or another but there are some groups that are particularly vulnerable in these situations, according to the Centers for Disease Control and Prevention. Heat sensitive groups include the elderly, infants and children. Drink more water than usual and don't wait until you are thirsty to drink. Check on a friend or neighbor and have someone check on you. Don't use the stove or oven to cook - it will make you and your house hotter. Never leave infants, children or pets in a parked car. Seek medical care immediately if your child has symptoms of heat-related stress. For the rest of us, make sure that you keep up with the latest weather forecast for your area. If a heat wave begins don't forget to stay hydrated, reduce time in the sun, and try to schedule strenuous activities to the early morning or evening hours. It's great to have fun in the summer. Just remember to be careful. One of the most notorious heat waves in U.S. history occurred across much of the Midwest in July 1995. Chicago was included in this event. On July 13, 1995, Midway Airport reported their all-time record high of 106 degrees. Because of incredibly high humidity levels, it felt even hotter (the heat index was around 120 degrees). Low temperatures were in the upper 70s to low 80s. According to a National Disaster Survey Report, the number of heat-related deaths in Chicago totaled 465. Most of these victims were 74 years old and higher. The report indicated that even though temperature forecasts for the area were accurate, local government and services failed to view the situation as a threat to public health across the city. As a result, there was no communication to the general public regarding dire consequences for sensitive groups. A combination of high daily temperatures and high nighttime temperatures, along with extremely high humidity levels created an unprecedented situation for the city. High soil moisture from the Plains to the Midwest created dew point temperatures near 80 degrees. The heat index is how hot it feels to the human body. With a temperature of 100 degrees and a dew point of 80 degrees, the heat index is 121 degrees. Generally, a heat index of 110 degrees or higher is extremely dangerous, especially for sensitive groups. Many elderly people in Chicago were confined to their homes and apartments without air conditioning. As their body temperatures rose, too much stress was placed on their hearts. Local hospitals were ill-prepared to deal with the large volume of patients. Since this event, local governments across the Midwest have taken measures to prepare for heat events. Better lines of communication exist between local governments, public safety officials and the local National Weather Service. There is also much better communication to the public about preparing for the heat and what measures can be taken when it arrives. Cooling stations and shelters are now set up across the cities when heat becomes an issue. Hopefully, these measures will help to reduce the number of deaths resulting from extreme heat events.